This circuit performs the calculus operation of integration. 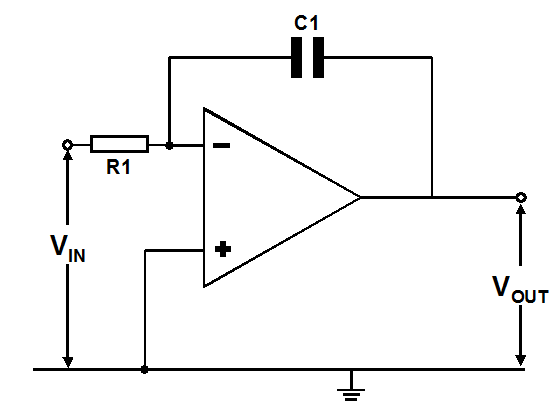 An operational amplifier with negative feedback applied via a capacitor (instead of a resistor) will perform the mathematical operation of integration. Such circuits are widely used in analogue computing - e.g. if the input voltage uses the analogue of acceleration (m/s/s), the output voltage is the analogue of speed (m/s). Another use of this type of circuit is to produce a triangular (or ramp) waveform from a square wave (or step) input; this technique is used in digital voltmeters and some forms of analogue/digital converters. Figure shows an Integrator. Interior noise is basically airborne or structure-borne. The excitation sources of vibratation and noise from engines can be divided as mechanical, combustion, and flow sources.